p(blue). Editor’s note: With this week's Front Burner column, we're starting a series of columns on fats. Helen Rennie here shares some of her favorite techniques for a variety of everyday fats. Next week, in his column Unexplained Bacon, Matthew Amster-Burton will delve into cooking with oils; he'll follow up later with a column on cooking with solid fats. Stay tuned, and we'll keep everything well oiled. “We don’t eat cream and butter unless they’re in dessert,” a client said to me once when we were planning a menu for her private cooking class. After several years of teaching, I'm no longer surprised at such diets. Somehow, we feel good about saturated fat only if it’s combined with at least a cup of sugar. As soon as I reach for a scant quarter-cup of heavy cream to finish a sauce for poached fish, the questions start pouring in: “Is it OK to substitute half-and-half? What about milk?” But if we’re making a dessert that calls for two sticks of butter? No questions, no problems. The icing on the cake? A student asked me if foie gras was bad for you. “Not compared to brownies,” I replied, offhandedly. Out of curiosity, I looked them both up later on Nutrition Data. Turns out I was more right than I expected: A standard portion of foie gras (two ounces) has eight grams of saturated fat, while an espresso fudge brownie from Starbucks has twice as much. (Admittedly, the three-ounce-plus brownie weighs more than the foie gras.) Besides, the foie gras is sugar-free and the brownie is, well, not. Sweetness and richness are not the only sensations food has to offer. Food has the power to make us feel refreshed or relaxed. When I cook, I don’t avoid cream and butter, but I use them strategically to give me the level of richness I desire without undermining the goal of the dish and overshadowing its subtler notes. My students often ask if I forgot the oil in the fennel salad, and their eyes get wide when I add yogurt instead of mayo into a bluefish pâté. I don’t think of those as “low-fat” substitutions. I am not making the same dish with less fat; I am inventing a totally different one. Here are some tips and techniques for using, not abusing, fats. To get the most out of this heavenly ingredient, use it to finish, not start, your dish. Just a teaspoon of fresh butter is wonderful melting into a warm steak or a bowl of pasta. But that teaspoon will most likely not be enough if you melt it in the pan and try to cook with it. I don’t believe in cream substitutions. 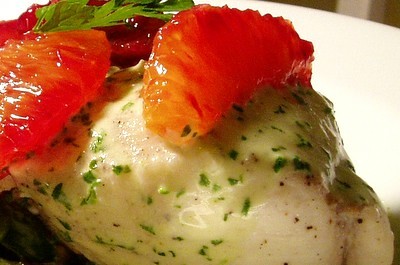 Light cream and even half-and-half can curdle in the presence of acidic ingredients (wine, tomatoes, citrus juice). If you want to lighten up a dish, feel free to cut down on the amount of cream as long as you use heavy cream. Keep in mind that most cream soups don’t really need the couple of cups of cream called for in traditional recipes. You can go as light as a quarter-cup, or skip the cream altogether. It’s your blender, not the cream, that gives your soup that silky texture. The cream just adds richness. The same applies to sauces. If you free up the cream from the responsibility of thickening your sauces and just use it for flavor, you can make some wonderful cream sauces that don’t leave you bloated. Instead of reducing a few cups of cream to thicken the sauce, stir in a little beurre manié (a paste of equal parts flour and butter) into the poaching liquid or broth. Just a tablespoon of butter and flour each can give your sauce the needed body. Now that the thickness issue is out of the way, you can go as easy on cream as you’d like. I don’t know what the food manufacturers put into low-fat mayo, but it tastes like emulsified plastic. 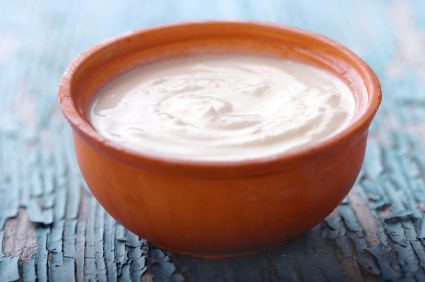 In cases where real mayo feels too heavy for a dish, I use plain yogurt. 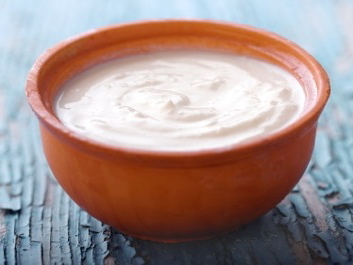 The Greek yogurt brand Total (made by the Fage company) is widely available and perfect for sandwiches and salads due to its lovely thick consistency. 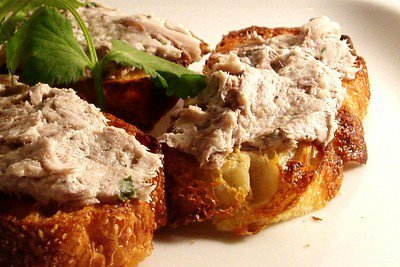 Seasoned with salt, a squirt of lemon, and a little mashed garlic, it’s simply unbeatable in chicken salad, tuna salad, fish pâtés, and as a sandwich spread. In fact, many of these salads are better with yogurt than with mayo. If you find the full-fat version too rich, try the one made with 2 percent milk. If a little cream gets skimmed off the top, or some water was strained from a product to manipulate its texture, I don’t mind. The products I shy away from are the ones that have unpronounceable ingredients added to replace the missing fat. I love all kinds of oils. But there are some dishes that are better off without them. If you are dressing a lettuce salad, you need oil; the lettuce will wilt if dressed with straight vinegar. But sturdier veggies don’t always need the traditional oily vinaigrette. Try a fennel-apple salad with fresh lime juice, grainy mustard, and cilantro. Or a cucumber salad with red onions, rice-wine vinegar, a pinch of sugar, and tarragon. Or my favorite: thinly sliced radishes with fresh lemon or lime juice. Add salt, and you’ve got yourself a perfect spring dish. By now you’re probably thinking, “What a hypocrite! First she tells us not to worry about whether the food is good for you, and then she cuts out most of the fat.” Here’s the deal: There are some dishes where richness is the whole point. If you start cutting down on butter in hollandaise sauce, it’s just not going to be hollandaise anymore. If you’re in the mood for hollandaise, just eat the real thing and enjoy every moment of it. But if you’re in the mood for a lighter dish, use less of what you’d normally use, and enjoy it just as much. p(bio). Helen Rennie is a Boston-based food writer (check out her blog) and cooking teacher.